The Papuan media outlet Tabloid Jubi has reported the arrest of four students at the campus of the Jayapura University for Technology and Science (USTJ) on 27 September 2018. A group of students had gathered at 09.00 am in front of the university building and expressed their support for Vanuatu, the Solomon Islands, Tuvalu and the Marshall Islands, which raised the human rights situation in West Papua during the 73rd Session of the United Nations generals Assembly. Around 11.00 am members of the Jayaura municipality police crowd control unit (DALMAS) entered the university campus and arrested eleven students. The students were temporarily detained at the Jayapura municipality police station (Polresta Jayapura). The ICP has received information from local human rights defenders about a military attack in the highland regency of Puncak Jaya on the 1 October 2018. According to the information, the military reportedly conducted several air-raids with four helicopters against targets in the Tingginambut District. The air-strikes were supported by ground forces. The human rights activists claim that the Indonesian army used explosive projectiles such as grenades and missiles during the air strike. The attack has allegedly caused the death of at least five civilians - among them a pregnant woman and at least two minors - and two members of the armed resistance (TPN-OPM). On 10 September 2018, six air force members allegedly tortured Sukay Alwan Suebu at the Sub-district police office near the Sentani Airport and the dormitory facility of the air force base in Sentani. Two air force members air force member intercepted Sukay Alan Suebu on his way home and brought him to the sub-district police station near the Sentani Airport, where they punched Sukay repeatedly in the face. Shortly after, four air force members came to the KP3U police station. Around 10.00 am, the six soldiers - all members of the special air force unit PASKHAS LANUD - brought Sukay Suebu to the dormitory facility of the air force base. They tied Sukay’s hands to the flag pole and collectively punched and kicked his body. He sustained bruises all over his body as a result of the torture and had to undergo medical treatment at the Yowari General Hospital in Sentani for two days. The torture was an act of revenge - Sukay Suebu allegedly slapped one of the air force member's brother, who had made fun of Sukay after being dismissed from his job. Joint security forces have raided the Timika branch office of the ’West Papua National Committee’ (KNPB), a political organisation that advocates the right to self-determination of the Papuan people. During the security force operation, security forces arrested nine KNPB activists - two activists sustained bullet injuries and had to be hospitalized. Erichzon Mandobar and Yakonias Womsiwor were allegedly holding a spear and a machete, as the security forces entered the KNPB office. The police only facilitated two medical treatments for the injured detainees within the first week after the incident but denied access to medical follow-up treatments. As a result of the police negligence, Yakonias Womsiwor’s injured leg got swollen and started to turn black. Six rubber bullet injured Yakonias' left leg. Police officers allegedly seizedÂÂÂÂ fire arm, ammunition and explosives. KNPB representatives have denied that KNPB activists had stored firearms or explosives at the office, claiming that the police used fabricated evidence to criminalize the organisation and break their peaceful resistance. The environmental Organisation Greepeace has published a new report on the implementation of ambitious goals to reform the palm oil industry. 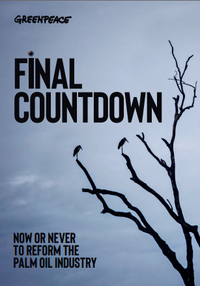 In 2013, Wilmar International, the world’s biggest palm oil trader, promised that within two years the company would only be trading palm oil from responsible producers that protected the environment and respected human rights. The report documents extensive deforestation and human rights abuses by 25 palm oil producer groups, all but one of which have supplied brands with palm oil in the last 12 months. The producers are known to have destroyed more than 130,000ha of forest and peat land since 2015 - 40% of this destruction with a total land area of 56,000ha took place in Indonesia's easternmost province of Papua. 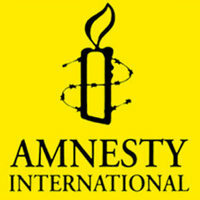 Ten months ago, three military officers tortured Ishak Dewayekua in the Kimam District of Merauke Regency. 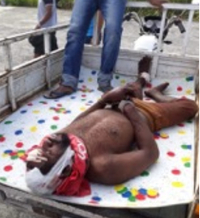 Ishak Dewayekua died as result of the severe injuries sustained during the torture. 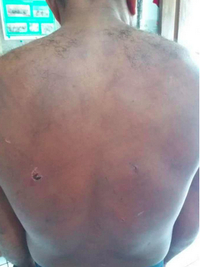 After torturing him, the three military members brought Ishak Dewayekua to the Kimam sub-district police station in an attempt to cover-up the torture. Now, local human rights defenders have reported the extra-judicial killing of Yudas Gebze from the neighboring Ilwayap district. One of the alleged perpetrators named officer Siampa appears to be a member of the Kimam Police Resort. TAPOL and the East Timor and Indonesia Action Network (ETAN) call for immediate release of Simon Carlos Magal and Jakub Fabian Skrzypski. In the event that Mr. Skrzypski is prosecuted, we call on all representative parties to ensure that he is afforded a fair trial. 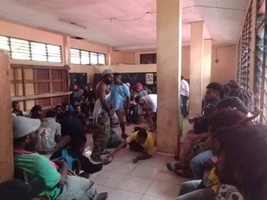 Indonesian police arrested West Papuan student Simon Carlos Magal (29) on 1 September 2018 in Timika, in connection with the arrest of Jakub Fabian Skrzypski several days earlier. 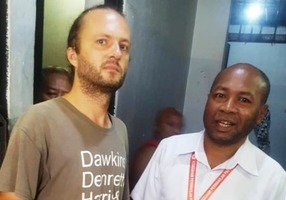 According to news reports, Mr. Skrzypski, a Polish citizen, was visiting West Papua as a tourist when he was detained by police in Wamena. He was arrested on suspicion of being a journalist, and for reportedly meeting with alleged members of an armed independence group in West Papua. 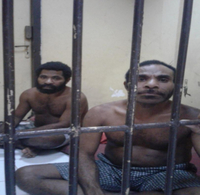 The two men have been charged with treason and are currently in jail awaiting trial in Jayapura. The Manokwari Institute for Research Study and Development of Legal Aid (LP3BH Manokwari) has documented the arrests of protestors during a peaceful demonstration in support of the United Liberation Movement for West Papua (ULMWP) in Bintuni, Papua Barat Province. On 8 September 2018 at 08.00 am, members of mobile police brigade (Brimob) unit Sub Den-4 Bintuni arrested 35 protestors and detained them at the Bintuni sub-district police station (POLSEK Bintuni). The current Coordinating Minister for Political, Legal and Security Affairs, General Wiranto, plans to intensify diplomatic efforts in the Pacific region to address the misrepresentation of many Pacific states regarding the situation in West Papua. According to Wiranto, many Pacific countries received misinformation about Indonesia's attitude towards West Papua. "So far we have forgotten, that there are many countries there which can endanger our souvereignty over Papua", stated Wiranto in an interview with the Indonesian news outlet KOMPAS. 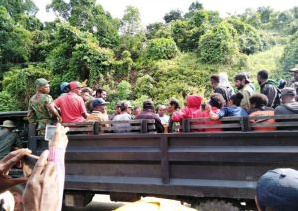 Activists from the Papuan Democratic Peoples Movement (Garda Papua) and students from the Jayapura University for Science and Technology (USTJ) have reported that local police forces in Jayapura dispersed two demonstrations and arrested 93 protesters. GARDA Papua had organized a peaceful protest on 3 September 2018, demanding the closing of the Freeport Mine in Tembaggapura, the demilitarization of West Papua and the construction of the market for indigenous Papuan women. 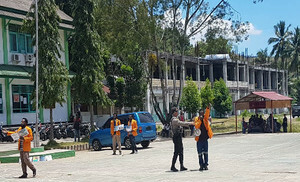 On the following day, 4 September 2018, supporters of the ‘United Liberation Movement for West Papua’ (ULMWP) gathered in Sentani and the USTJ Campus in Abepura. The protest was carried out in support of Vanuatu and other Pacific island countries to raise the issue of self-determination for West Papua at the upcoming Pacific Islands Forum (PIF) meeting, which is currently taking place in Nauru until 9 September 2018. 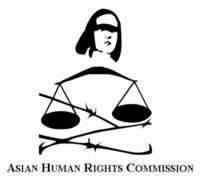 The ‘Association of Human Rights Lawyers for Papua’ (PAHAM Papua) reported three cases in which the local police in West Papua allegedly violated law enforcement procedures during arrest and detention of suspects. 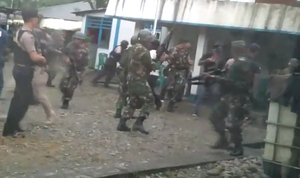 All arrests occurred in the city of Timika, whereas the obstruction of lawyers was reproted from Jayapura. According to information from PAHAM Papua, police conducted arrests without warrant, applied excessive use of force during arrest, prevented family members to meet with suspects during detention and obstructed lawyers during consultation visits at the detention facility. Polish citizen Jakub Fabian Skrzypski (39), who is described by the police as a journalist and had been arrested in Jayawijaya regency on 26 August 2018, might face criminal charges. Officer Ahmad Mustofa Kamal, the spokesman of the Papua regional police (Polda Papua), stated in an interview with the independent media outlet ‘Tabloid Jubi’ that Skrzypski will be charged with the treason articles 106 and 110 of the Indonesian Criminal Code KUHP, article 53 KUHP regarding the attempt to commit a criminal offense and article 55 KUHP on committing, ordering or participating in a criminal offense. The criminal offense of treason alone carries a maximum sentence of 20 years imprisonment. In February 2017, PT Freeport Indonesia (PT FI) introduced a furlough program to release its workers from their obligations and return them to their point of leave. The Freeport laborers went on strike. PT FI claimed that the workers’ strikes were illegal and thus the strikers were considered to have "voluntarily resigned". In early 2017, PT FI reportedly fired around 4,200 workers participating in the strike. So far, attempts to involve human rights organisations, ministries and government institutions have not lead to a perceptible outcome for the dismissed workers. 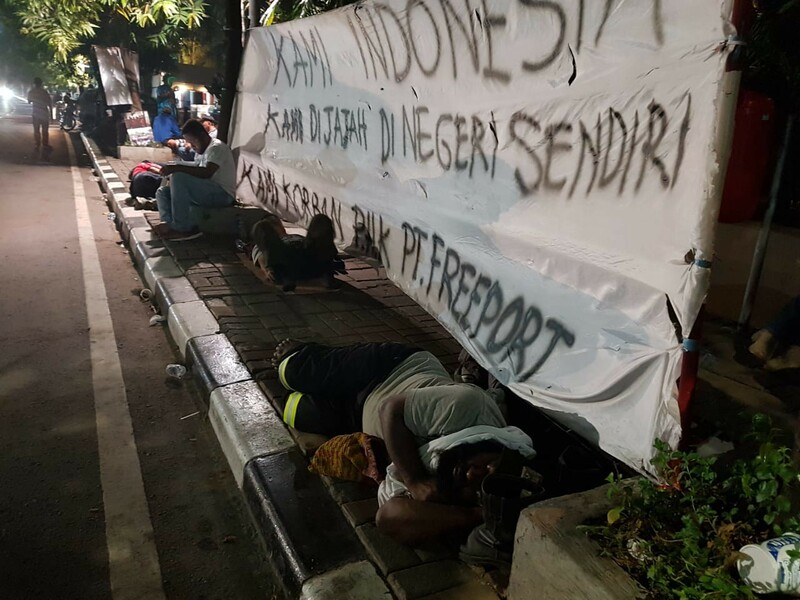 on 30 August 2018, the workers with the support of the Jakarta-based human rights organisation LOKATARU reported the Minister for Employment Hanif Dhakiri to the Ombudsman national office in Jakarta.